If those of you who have 6-inch Marvels would post some pictures and comments to this thread i would be very appreciative. I have a 6-inch Springfield 1911 that I used in bullseye competition many years ago. I have 2 regular Marvels but recently was smitten with the idea of buying a 6-inch unit. However, having never seen one i its difficult to make the decision to waste this money, lol. Pics, info. on performance, quirks, and how you issue it would be very welcome. Come on. Nobody has one? Maybe I have my answer, lol. I have one. It shoots very well but like all longer barrels takes extra attention to follow through. Mine came with a .385" test target from Marvel and I believe it has a slightly tighter chamber than other Marvels I've had. It seems to prefer SK Standard ammo. I have one. Got from Larry's few years ago at Perry. Went to five inch because of last round lock back. Just my preference. I shot a 6 inch kart for years. Lots of 890 plus with it. Broke 2650 using it. They were had to keep running. Thinking lately of trying the 6 inch marvel. Awesome,thx! John, is the barrel 6 inches with the muscle cut flush like that, or is it shorter? Cool. Thank you. I love all these conversion units. I can't stop buying them lol. Lawboy wrote: Cool. Thank you. I love all these conversion units. I can't stop buying them lol. Don't feel bad, you are in good company. Check out the second picture in the link. It shows this years champion shooting a Marvel. Awesome. I am curious what folks' marvel/nelson guns weigh with optic mounted? I have two marvels built on dedicated 2011 frames. One weighs 30ozs with a Razor Venom and aluminum magwell and polymer MSH and aluminum frame with full dust cover. The other weighs 35.3ozs with a 1-inch Leupold/Gilmore dot sight, a steel Maxwell and MSH, and an aluminum frame with dust cover. Both have polymer grip frames. Are the single stack builds a lot heavier? Off topic, but, what kinda spotting scope setup is Shue using in that pic?? james r chapman wrote: Off topic, but, what kinda spotting scope setup is Shue using in that pic?? I shot with Jon in MD state championship he has this scope. I had a chance to speak with Vladimir at Pardini while at Perry. Vladimir does quite a bit of International coaching. He explained why Pardini added the 6" barrel. It's intended for 50 yard shooting. They found that the 6" will eliminate flyers that that happen with shorter barrels when shooting at 50 yards. He did get into the rate of burn of 22 powder and the reasons that cause the flyers. However the fan and AC was making so much noise plus his accent I didn't get it all. I may be incorrect but I'm thinking he said that the powder was still not all burnt in shorter barrels and the burning as the bullet exited the barrel caused a jet stream to kick of a flyer. By adding the longer length they eliminated the flyers. He also was explaining how to set-up grips properly and if not done correctly could cause right to left hits on the target. He was drawing diagrams on another shooters hand that I didn't get to see. I went back later to ask more questions but unfortunately he left! I do plan to get that information and more on the 6" improvement, I intend to speak to him one to one in a good location. I believe Reiter also shot a 4" High Standard custom by Chow before he went to the 208s. A friend on mine copied his design and shot it for years. I never checked one out but a friend of mine has the 4" Pardini and complains about the 50 yard accuracy. He's a High Master. 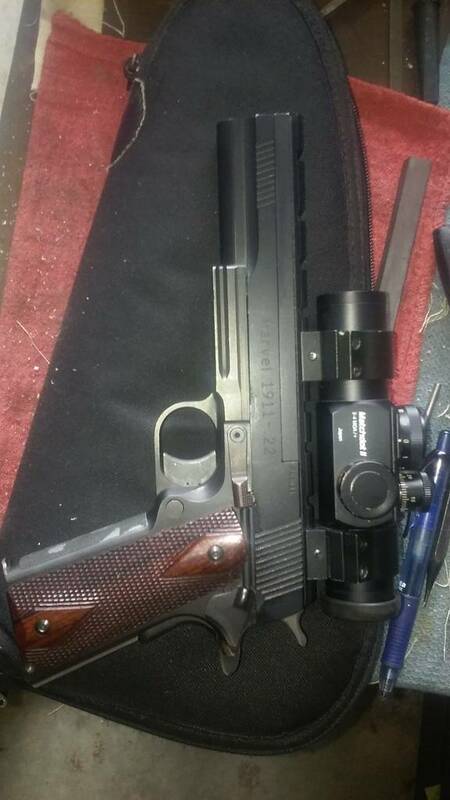 Another friend has a Walther, it too didn't shot good at 50 until he replaced the barrel with a 6". All my .22s have 6" barrels so I don't know just reporting what Vladimir said. I might add I did have an older Walther GSP, shot some of my best scores with it but changed when I was getting near 2600. It would shoot a good 50 yard group off the bench but would always have one out of the group. Group size was easily covered by a Quarter except usually one sometimes 2 but on occasion none were out of the Quarter size group. Quite a bit out, if the group was in the X ring the maverick would be in the 9. Tried all brands of ammo, most shot the same group size though some larger than others but all had that maverick. Was not uniform, not consistent was high, low, left, right or combination of the location. Tighten the screw, put Loctite on the barrel, checked the grips however no matter what I did I had that one and sometimes 2 or none that didn't want to follow the group. Not often but one would wander off into the 8 ring. Ransom rest nor shooting off sandbags helped. I have a 6 inch Marvel conversion and like it alot. I have shot some very respectable SF targets with it and the reliability is excellent. I think most shooters choose their barrel length based on balance rather than accuracy. The new 6 inch Pardini barrel is just another choice. I admire them for paying attention to the US market with this introduction. I have handled one and it feels a little front heavy to me but I did not have the opportunity to try it with the weights removed. My hat is off to Vlad and his crew for catering to our sport. He is no doubt responsible for relaying our thoughts back to Pardini initiating the changes we have seen to make the SP22 more suitable for bullseye competition. I feel the same about Vladimir. I have talked to salesmen trying to sell me their gun and in a short time proved they know nothing about shooting. Taking to Vladimir over the years I've always was impressed with how much he knows about the sport and the guns available. At the time Vlad was explaining the reason for the addition of the 6" barrel to Brad the smith with the AMU. I consider Brad one of the best there is when it comes to pistol smithing and doubt he would be talking to Vlad if he thought the information was BS. Here is mine, on a STI Target Master lower, with Rink grips. It weighs 42.0 oz with NO magazine, 46.2 with. Interestingly, this barrel is lighter than the 5" Nelson I purchased recently.